The Tumpat district lies in Kelantan, about 10km northwest of Kota Bharu and adjacent to the Thai border. The district takes its name from the small town of Tumpat. While the town is rather unimpressive, the district is quite interesting due to the large number of Thai Buddhist temples present in the area, some of which are quite picturesque. 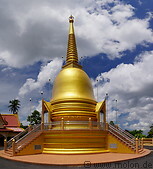 The temples were erected by the local Thai minority and by Chinese Buddhists. To visit them it is advisable to either book a tour or rent a car, because public transportation is not adequate to visit the temples. In the Tumpat district rice is intensively grown, with plenty of rice paddies everywhere. Pantai Sri Tujuh is a beach to the northwest of Kota Bharu, close to the Thai border. This is a long, sandy beach extending for a few km until the Thai border. In the evenings the local population comes here for dinner or for shopping in the open air markets.